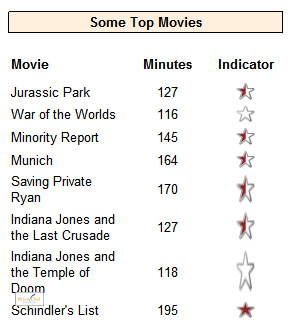 We now want to put an indicator in the third column. The first step, surprisingly, is to add a rectangle. 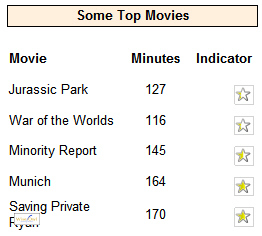 In this example, when a film name spans more than one line, so does its indicator. This usually looks messy! 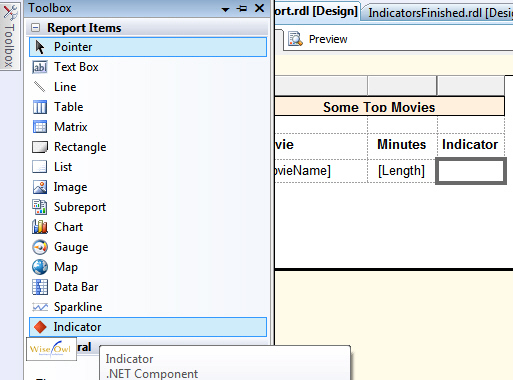 By placing an indicator inside a rectangle, you can stop SSRS stretching indicators as above. The categories on the left - Directional, Symbols, etc - are pointless, since you can see all the visible symbols in one go anyway. It doesn't matter too much which symbol you choose, as it's easy enough to make changes afterwards anyway. 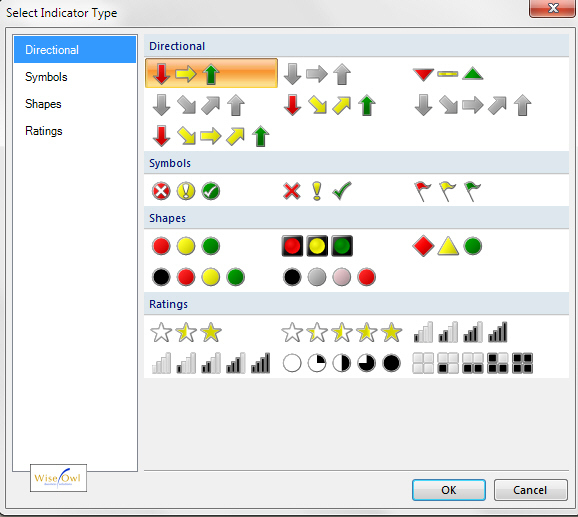 There are in fact more symbols that you can use than are shown in this dialog box; to get at the others, you need to change the indicator's properties after you have created it. Note that these symbols don't mean that you will get one, two, three, for our five stars - instead they mean that you will always get one star, but the degree of shading will vary. Click on the indicator you've just added, then click on the drop down arrow shown and choose a field to assign to it. Here we're showing the length of films. 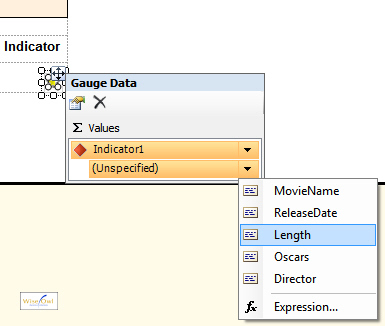 You can also drag a data field onto the indicator, and from there onto the (Unspecified) property, to achieve the same result. If you've followed the steps above, you should now have a fairly unpromising-looking indicator! Since SSRS has set default scaling, the results aren't what we want. It's time now to consider the issue of scaling.